One size fits most women. Scarf measures 5 ½" x 65" without fringe. MODA DEA™ ''Tutu™'', Art. R122 (1.76 ounce/92 yard ball) No. 3278 Geranium CA: Hat - 2 Balls; Scarf - 3 balls. MODA DEA™ ''Wild™'', Art 121 (1.76 ounce/103 yard ball) No. 9985 Hot Tamale CB: Hat - 2 Balls; Scarf - 2 balls. Crochet Hook: 6.5mm [US K-10.5]. Yarn needle. GAUGE: Hat: Rnds 1 and 2 = 2 ½" across. Scarf: 6 rows = 5". CHECK YOUR GAUGE. Use any size hook to obtain the gauge. 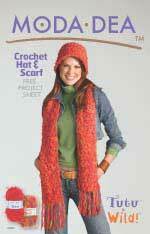 Note: Hat and Scarf are made using 1 strand each CA and CB held together as one. Ch 4; join with a sl st in first ch to form a ring. Rnd 1: Ch 2 (counts as hdc). 11 hdc in ring; join with a sl st in top of ch-2 - 12 sts. Rnd 2: Ch 2, hdc in same ch as joining, 2 hdc in each hdc around; join in top of ch-2 - 24 sts. Rnd 3: Ch 2, hdc in same ch as joining, hdc in next hdc. * 2 hdc in next hdc, hdc in next hdc; rep from * around; join - 36 sts. Rnd 4: Ch 2, hdc in same ch as joining, hdc in next 2 hdc. * 2 hdc in next hdc. hdc in next 2 hdc; rep from * around; join - 48 sts. Rnd 5: Ch 2, hdc in each hdc around; join. Rnd 6: Ch 2, hdc in same ch as joining, hdc in next 3 hdc. * 2 hdc in next hdc. hdc in next 3 hdc; rep from * around; join - 60 sts. Rnd 7: Ch 2, hdc in back lps only of each hdc around; join. Rnds 8-14: Rep Rnd 5. Brim-Rnd 15: Ch 2, hdc in same ch as joining, hdc in next 2 hdc, * 2 hdc in next hdc, hdc in next 2 hdc; rep from * around; join - 80 hdc. Rnds 16-20: Rep Rnd 5. Fasten off. Weave in ends. Row 1 (Right Side): Dc in 6th ch from hook, dc in next 2 ch, ch 3, dc in next ch, [skip next 2 ch, dc in next 3 ch, ch 3, dc in next ch] twice, skip next ch, dc in last ch; turn. Row 2: Ch 3 (counts as dc), [(3 dc, ch 3, dc) all in next ch-3 sp] 3 times, dc in top of beg ch-5; turn. Row 3: Ch 3, [(3 dc, ch 3, dc) all in next ch- 3 sp] 3 times, dc in top of ch- 3: turn. Rep Row 3 until scarf measures about 65". Fasten off. Weave in ends. Fringe: Holding one strand each CA and CB together as before, cut fourteen 18" strands. Knot 7 fringes across each end of scarf as follows: fold strand in half forming a loop. Insert the crochet hook through the fabric from the wrong side and draw the loop through, then draw the yarn ends through the loop and tighten. Rep across each end of scarf. Trim yarn ends. ABBREVIATIONS: beg = beginning; CA, CB = Color A, Color B; ch = chain; dc = double crochet; hdc = half double crochet; lps = loops; mm = millimeters; rep = repeat; rnd = round; sl = slip; sp = space; st(s) = stitch(es); * = repeat whatever follows the * as indicated; [ ] = work directions in brackets the number of times specified.